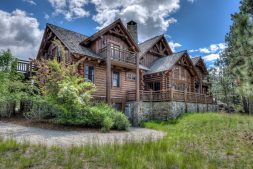 Discover luxury Montana homes in the Bitterroot Valley here. 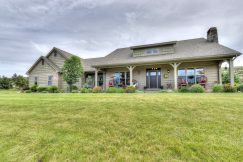 If you are looking for luxury homes in Western Montana and the Bitterroot Valley, you are in the right place. 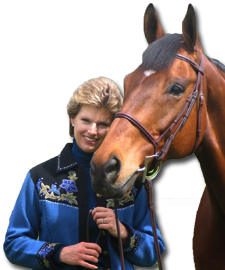 See some of my listings below, and feel free to contact me directly here for additional information. 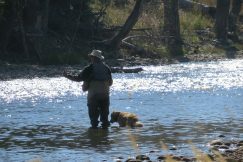 Nestled in the majestic Ponderosa pine trees and minutes from the Town of Hamilton is the Bitterroot River Retreat offering 14 private acres and over 1000 feet of prime Bitterroot River Frontage. In keeping with the natural beauty of the river the owners designed a riverside cabin style home to compliment the native flora and fauna. Natural and reclaimed materials were used in the construction of the 3900+ sq ft main house complete with over 1500+ sq ft of covered and screened in porchesKnown as one of the blue ribbon trout fishing rivers in Montana large rainbow, cutthroat, browns and brooks are right outside your door. It is a magical environment – the whispering of the majestic pine trees and the sound of the rushing creek right outside of your home. Welcome to Tin Cup Creek Hideaway. Located on 20 + Creekside acres in the exclusive Chief Joseph Estates this custom designed and built luxury log home will exceed your every desires.Friends and family will fall in love with the 2 bedroom separate log guest cabin which includes a fireplace, full kitchen, full bath and loft area for children.The property is level and includes a combination of native meadows, Ponderosa pine trees, parklike improvements and is home to the resident elk, white tail deer, moose and an occasional black bear. Located in the private community of the Stock Farm Golf and Sporting Club is the Louisiana Purchase – a meticulously maintained custom designed ”Cabin” featuring beautiful log accents throughout. Each of the 6 private en-suite bedrooms are well appointed with inviting decor complimenting the rich western Montana heritage.The great room welcomes friends and family with the gorgeous floor to ceiling wood burning rock fireplace, massive log timbers, multiple entertainment and eating areas, recessed library overlooking the entire Bitterroot Valley and roomy gourmet kitchen.The Louisiana Purchase is conveyed turnkey and is ready for your arrival. If interested, this offering may be acquired using a 1031 exchange as it has shown investment income over the past years. 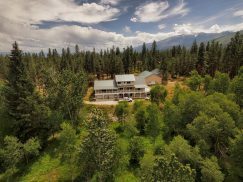 Nestled within the trees in the Bitterroot Valley and close to the Town of Hamilton is Mill Creek Hideaway – a discretely listed stunning custom built residence on 19.81 acres of unspoiled nature. This luxury home is designed to offer the homeowner a contemporary lifestyle with an inviting open floor plan. There is also a separate guest log home for your guests and family to enjoy. In addition to the two residences “ the ultimate “Shop” is included. Offering over 5,000 sq ft of enclosed space- this fully finished building is ready for your hobbies , RV or equipment. Welcome to the Montana Leland House offering a tasteful blend of elegant southern charm with a touch of Montana throughout. Located on 20 private acres this very special residence is a delight to tour.The exterior is an architectural delight. Rich roof lines, clear vertical grain cedar siding, multiple decks, underground sprinklers, a parklike setting and mature landscape. The location is paramount as it is just minutes to downtown Hamilton but with the gated entry and majestic pines – you will feel as if you are miles away from your neighbors. Price has been substantially reduced. Seller interested in offers. 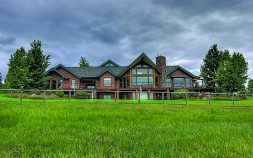 Located on 16+ pristine acres this luxury home offers the best of Montana living. Artfully detailed walls, stunning use of timbers and beams,rough sawn floors and stone. The main level includes a grand living area, gourmet kitchen, master suite, oversized laundry area and first guest suite. The lower level has the game room, second guest suite and hobby room. The loft level is perfect for your office or library. All three floors are serviced by the in house elevator. The lower level has the game room, second guest suite and hobby room. All three levels are serviced by the interior elevator.Also included is a separate shop with artist studio complete with separate septic system. Water rights are from Big Creek and lake shares are included. This well designed residence is surrounded by million dollar ranches, has no covenants and accessed from a paved road. The home is located in the center of the Bitterroot Valley offering easy access to Missoula, the Missoula International Airport, all cultural events and dining.. Located in the established Arrow Hill development is this award winning custom Rocky Mountain Log home situated on 3.75 waterfront acres. Built in 2001 the rustic warmth of this residence is evident throughout. The main floor offers rough sawn fir floors, vaulted ceilings, character log accent pillars & floor to ceiling windows framing the Bitterroot Mountains and Valley.The home includes central air conditioning, two outdoor entertainment areas complete with fireplace, a large private pond with dock, water rights and sits on the rim with massive views of Trapper Peak, Blodgett Canyon and the Bitterroot Valley. Warm elegance abounds in this meticulously maintained residence. Located on 5 private tree lined acres this inviting custom built home awaits your arrival.Utilizing an open concept an abundance of natural light flows throughout the home. The main floor encompasses an oversized living room with wood burning fireplace, deluxe kitchen, enclosed atrium and sun room, and master suite with steam shower.Outside is like having your own private park. Custom flower gardens, a multitude of decks and patios, gazebo, small orchard, meandering water ditch, views of the Bitterroot Mountains and hot tub offer a very relaxing environment. The acreage is irrigated and fenced for horses.